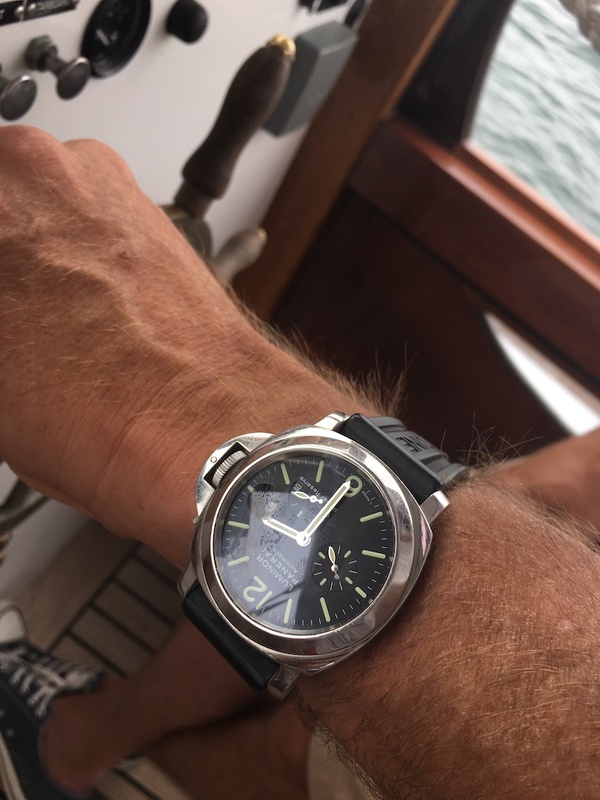 If you are a fan of Panerai history, you are well aware that Officine Panerai has always had strong ties to the sea. 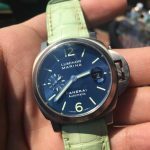 Whether it was creating diving instruments for the Italian Royal Navy (Marina Militare) or designing the latest watch for the frogmen to wear while riding on the manned torpedoes, Panerai and the sea have gone hand in hand. 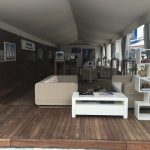 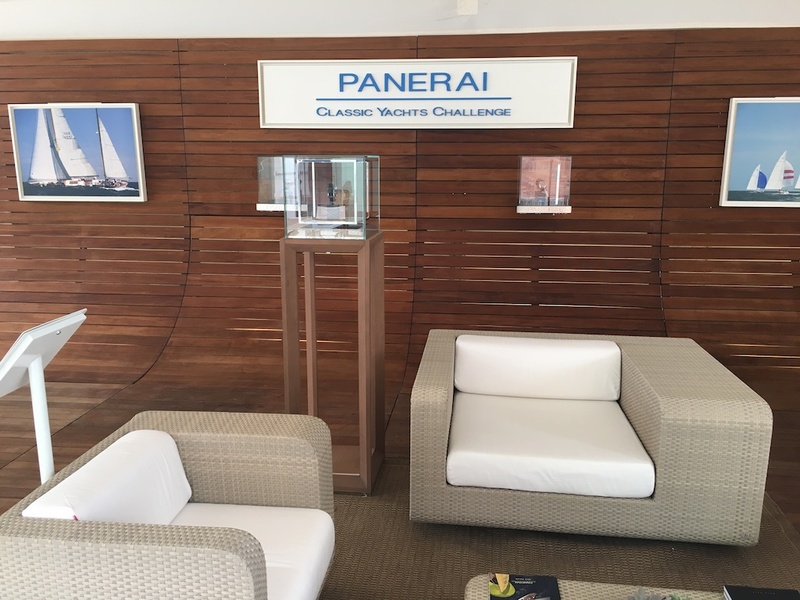 Although the brand no longer makes military equipment or watches directly for the Royal Navy anymore, they have continued their connection to the sea with the sponsorship of the Panerai Classic Yacht Challenge Circuit. 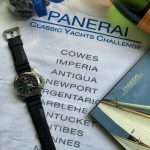 Including 2016, Officine Panerai has sponsored the event, which spans over North America, Antigua, Great Britain, and the Mediterranean, for the past 12 years. 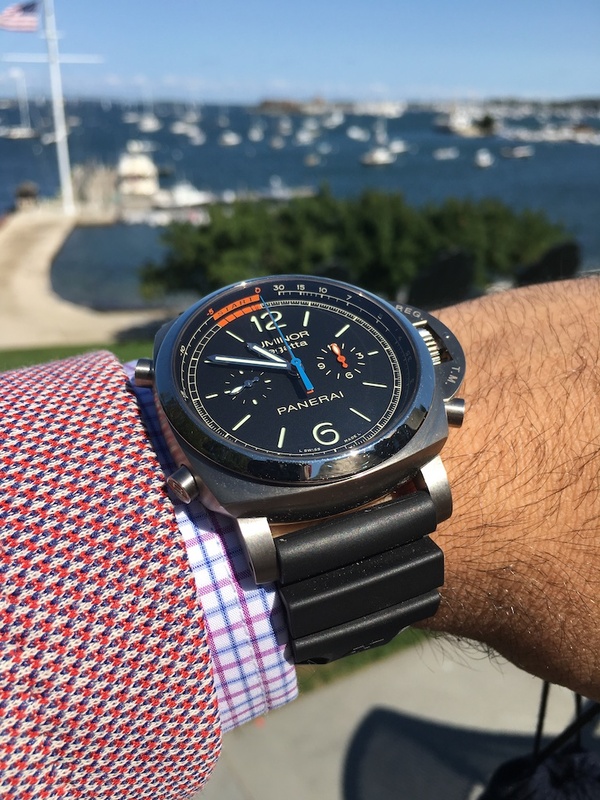 During labor day weekend, I had the luxury of being invited to the Newport, Rhode Island leg of the North America Regatta by Panerai North America. 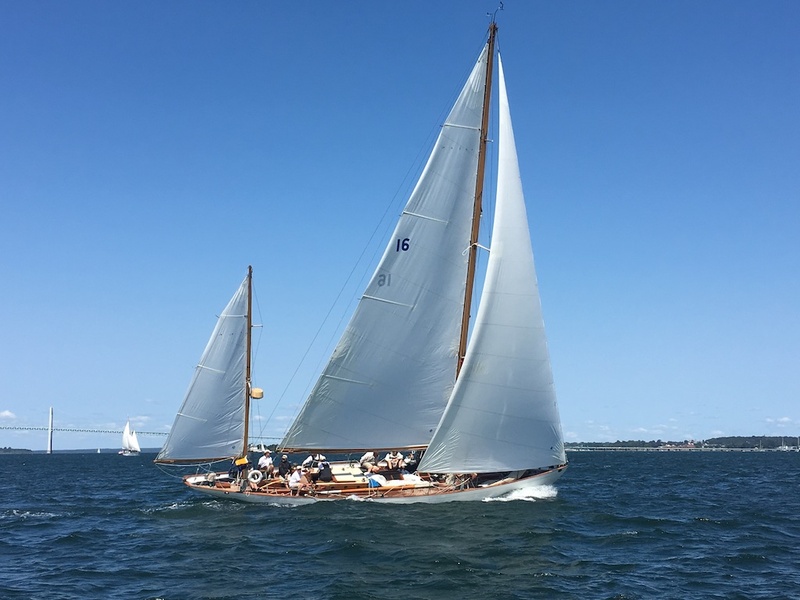 I was able to take in the sites, sounds, and beauty that is classic yacht racings. 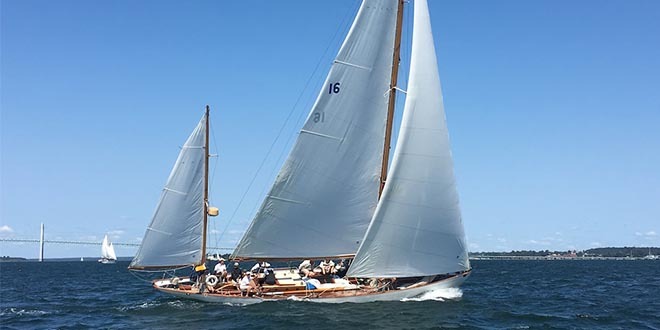 Having never been to an event like this before I was very excited see these masterfully restored yacht, some from the turn of the century, slice through the water with only the power of the wind in their sails. 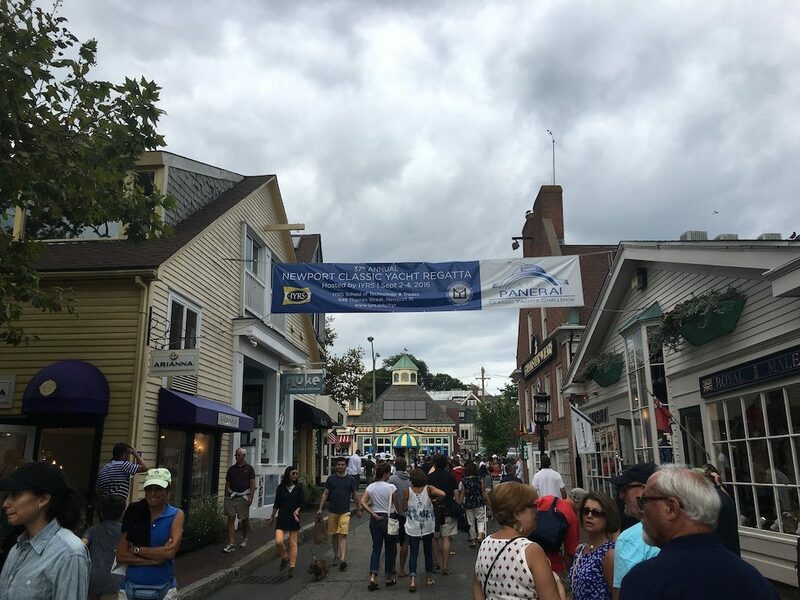 Arriving in Newport I couldn’t help but think how much it reminded me of a larger Balboa Island here in Orange County, California where I reside. 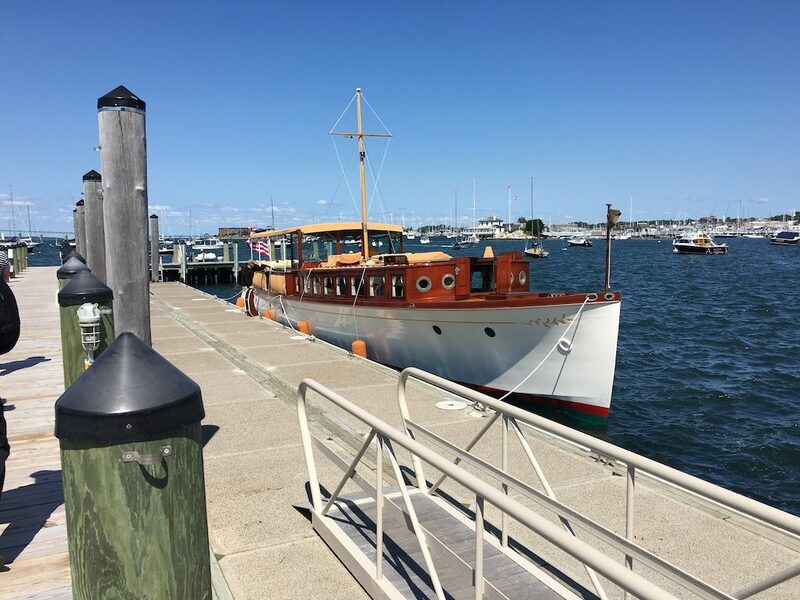 The city of Newport which is quaint, filled with amazing historic architecture and nestled amongst rows and rows of gorgeous yachts spanning from the early 1900’s to the present. 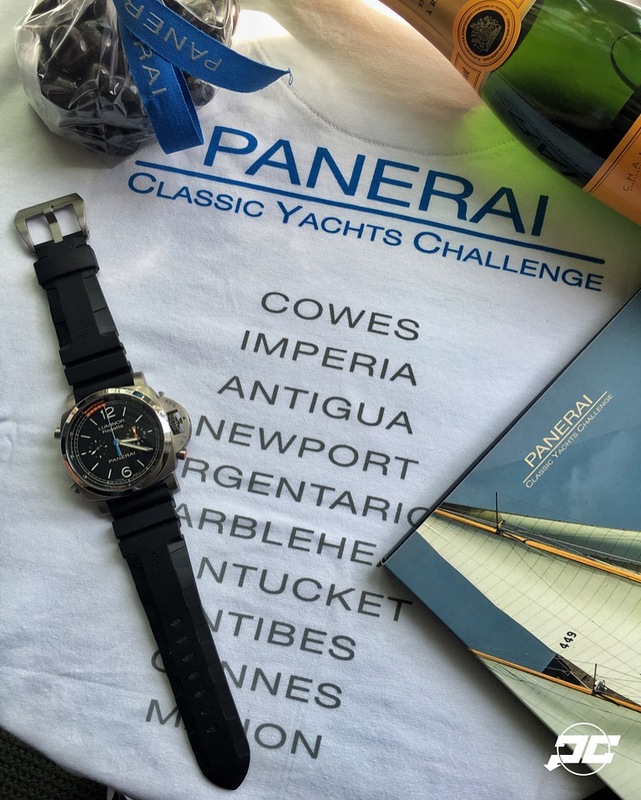 I was nicely welcomed at the hotel by a care package put together by the Panerai team with all the essentials I would need for a weekend on the water as well as some champagne to get me ready for the events to come! 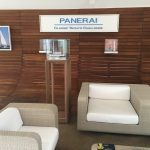 Before the first day of racing we had a welcome dinner that was arranged by the team at Panerai which included the new President Giovanni Carestia whom I had the luxury of spending time with at our private event held in Beverly Hills a few months back. 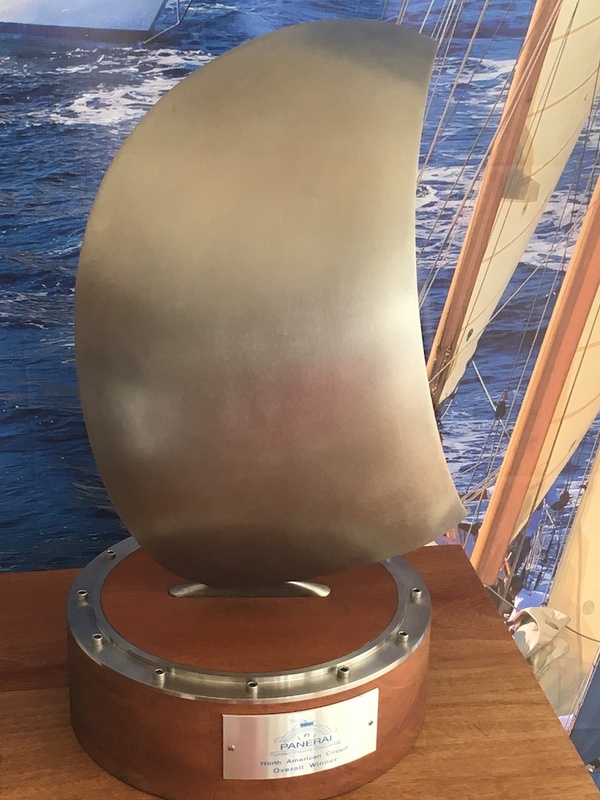 The dinner was a moment where I was able to really meet the heads of the North America circuit and learn more about yacht racing as well as meet my fellow guests that would be sharing the experience with me on the boats for the weekend. 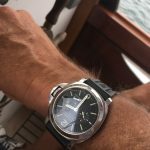 The group included Oliver Smith and his wife (Oliver Smith Jewelers), Lane Schiffman and his wife (Shreve & Co), Laurie Kahle (Freelance Writer), and Jared Stern (Freelance Writer). 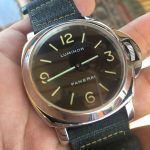 We spent the night talking Panerai past, present, and future as well as what the weekend will hold in store for us. 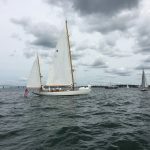 Day 1 of the race started on a rather overcast day as we boarded a vintage lobster boat that was chartered for us to follow the races. 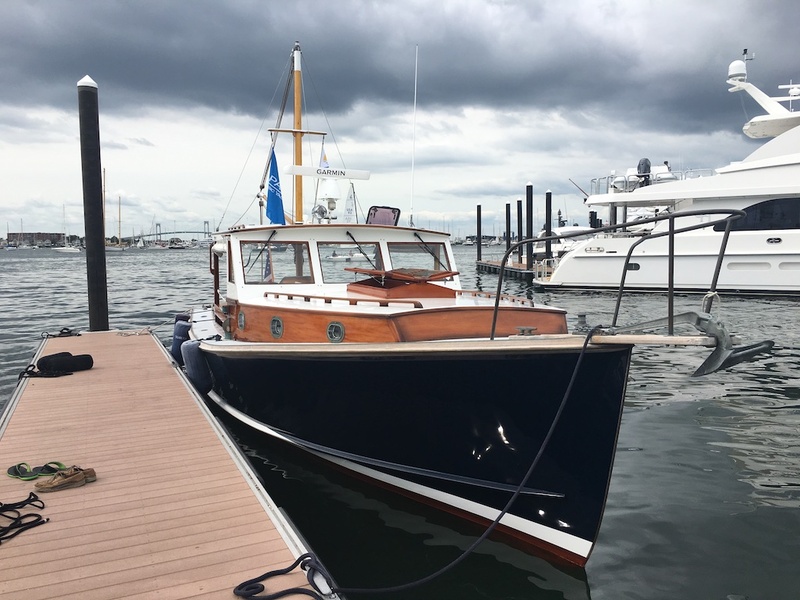 This was no ordinary lobster boat by any means, it had all been hand restored and finished by the captain himself who was a Paneristi way before the Regattas ever were sponsored by Panerai. 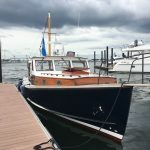 The captain who was finishing up his extended studies at IYRS, the International Yacht Restoration School where the awards dinner and hospitality suite would be held, was using his boat at the final project to showcase all the woodworking on this boat. 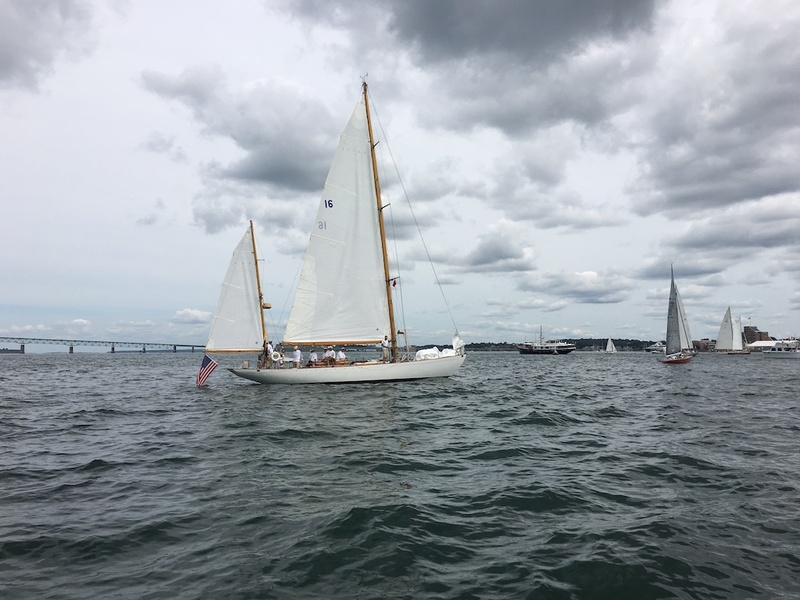 As the race began in the morning, we followed the yachts that were comprised of different classes through the water as they began the race swiftly. 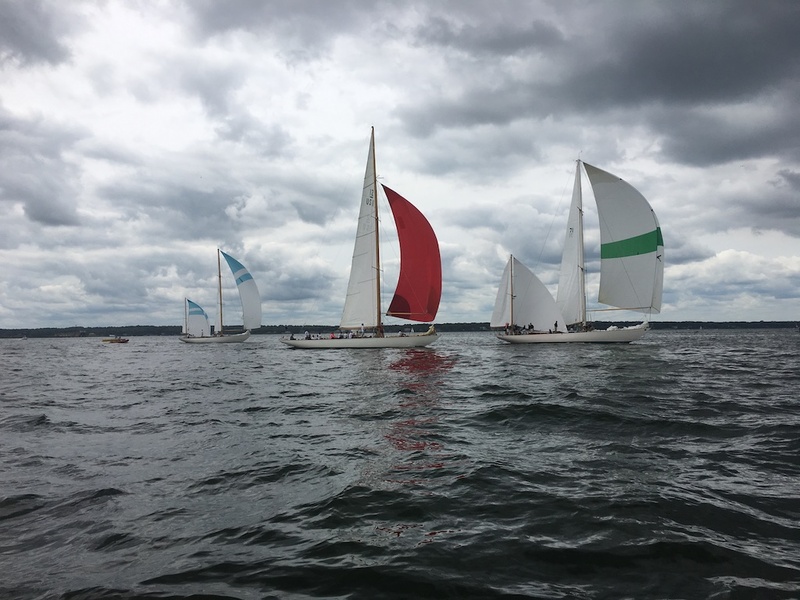 Unfortunately for all of us the weather was not cooperating and the wind almost came to a stand still forcing all of the yachts to come to an abrupt stop after their start. 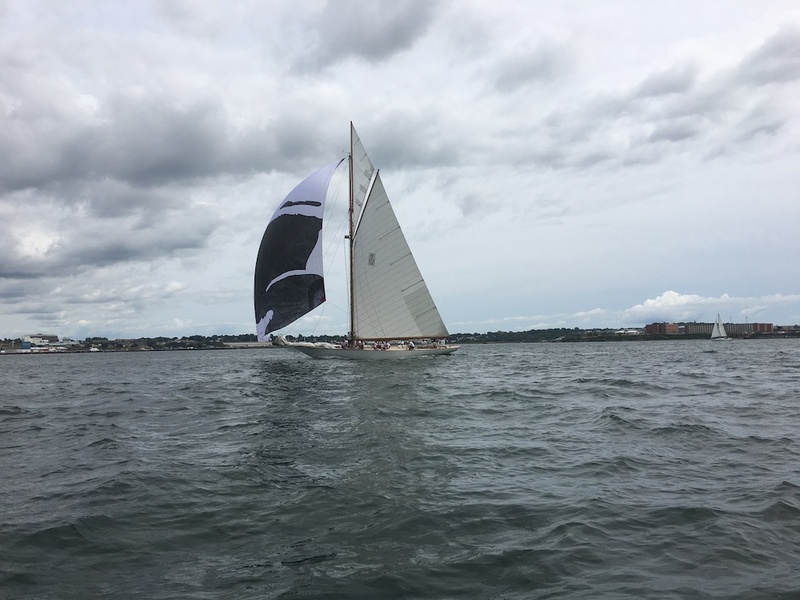 In fact, most of the races on day one were not able to finish because of the lack of wind. 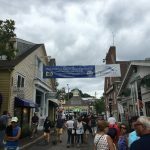 The race organizers were a bit weary of day 2 because there were also weather concerns for that day but on the opposite side of the spectrum. 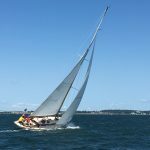 They were fearful that the weather would be really bad and too much wind making it dangerous for the event to continue. 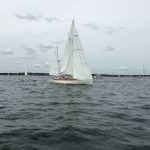 We wouldn’t know how the day would plan out until the morning of, so we had to head back to dry land and call it a day. 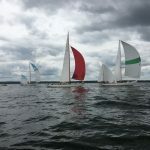 Day 2 of the PCYC, which we thought would be the worst weather wise, turned out to be the most amazing day. 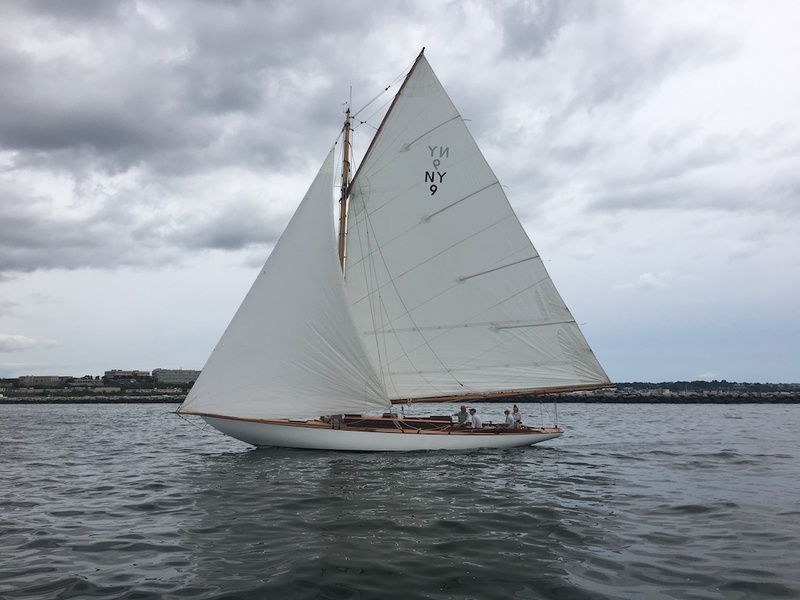 We started out our day at the New York Yacht club situated upon a hill overlooking the gorgeous water that the yachts would be sailing in a few hours. 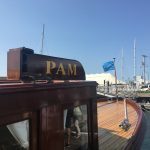 When the time came to go watch the racing we were picked up an amazing restored Rum Runner fittingly named “PAM”. 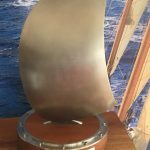 The rum runner which had the most amazing restored 2 toned floors which can be seen in the picture I took of all the watches that were worn on the boat was first commissioned in the early 1900’s and was coming up on it’s 100th birthday shortly. 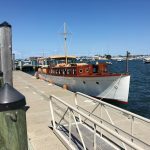 If only we knew all the stories this boat could tell from the prohibition era! 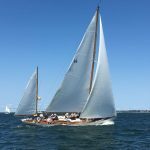 As previously mentioned, the weather was amazing for sailing and the race was fever pitched from the moment of the first class start. 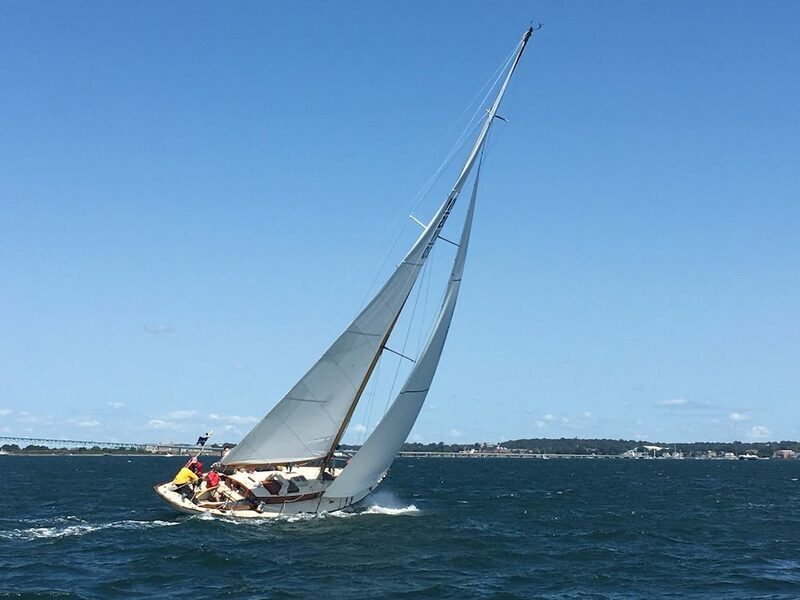 I was able to really take in the beauty of the races, watching them do hairpin turns in a large classic yacht as if was a Formula 1 racecar around the track. 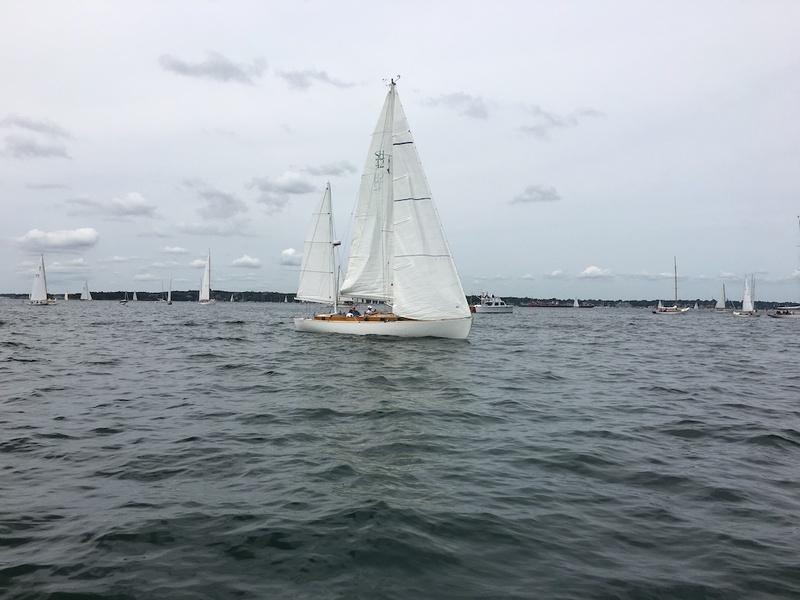 Watching the crews shift from side to side balancing synchronously was a site to behold. 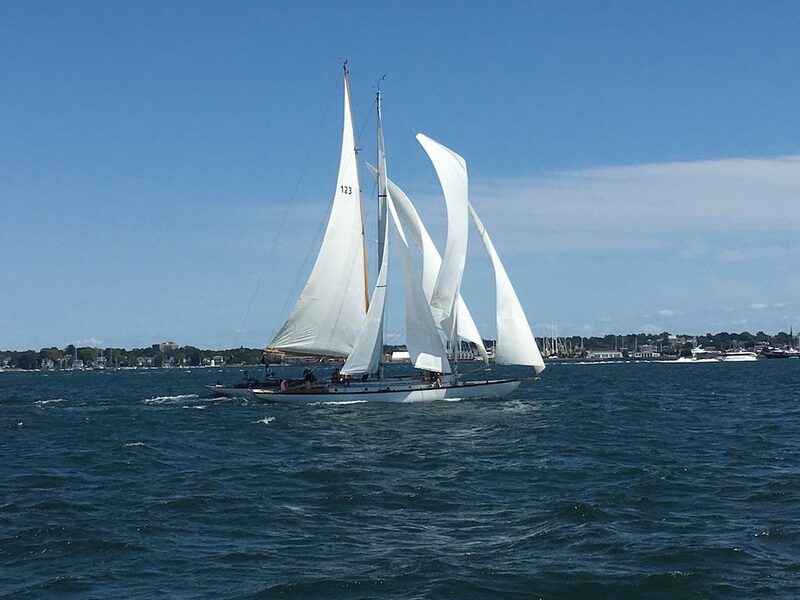 I never imagined cruising by the yachts cheering them on as many came to a photo finish would be so invigorating. 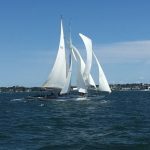 You truly see how much effort goes into navigating such a large yacht through the waters when you are this close to the action. 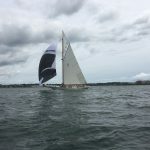 The weather scare was non existent and all of the racers were able to finish on this day which was a relief for all of the people involved in bringing such an amazing race to life. 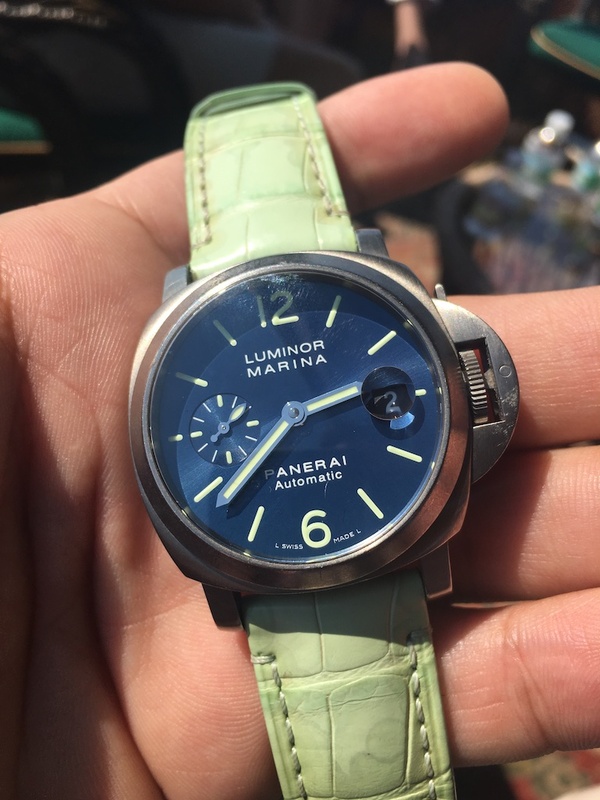 I as well got to spend a little time with an amazing timepiece in the Panerai collection which fit perfectly for this weekend. 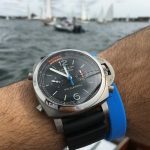 I had the luxury of enjoying the Panerai PAM526 Luminor 1950 Titanium Chrono Regatta. 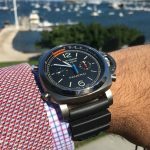 The PAM526 is powered by an in-house P.9100 movement with a 3-day power reserve. 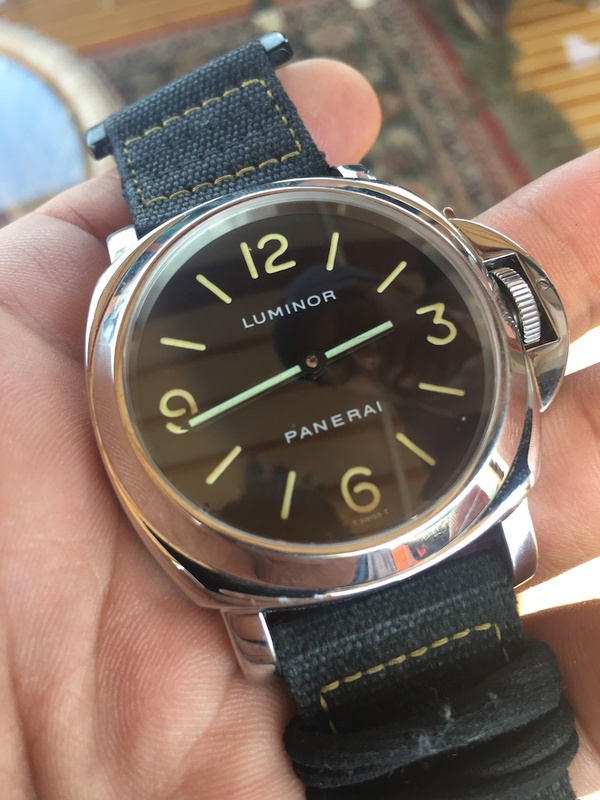 The dial and finishes on the PAM526 are a step out of the norm for Panerai in that it features 2 different colors along with the black dial. 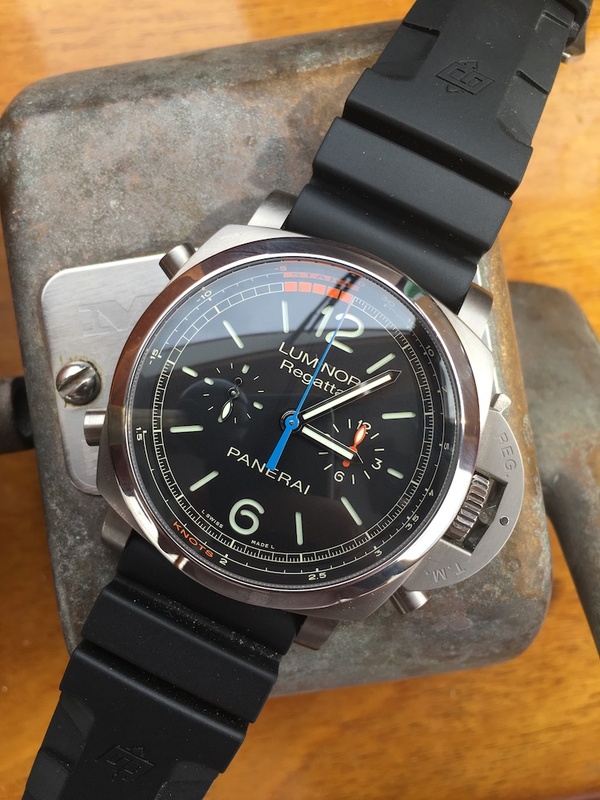 It features the Panerai blue as well as a complimentary orange on the hands of the chronograph. 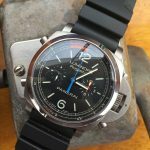 All of this beauty is housed in a brushed titanium case with a polished titanium bezel. 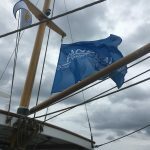 You will definitely see more pictures of this beauty on our Instagram account in the days to come. It was a perfect companion throughout the days of the Regatta and it really was in its element as we crashed through the waves while following the yachts cross the finish line. 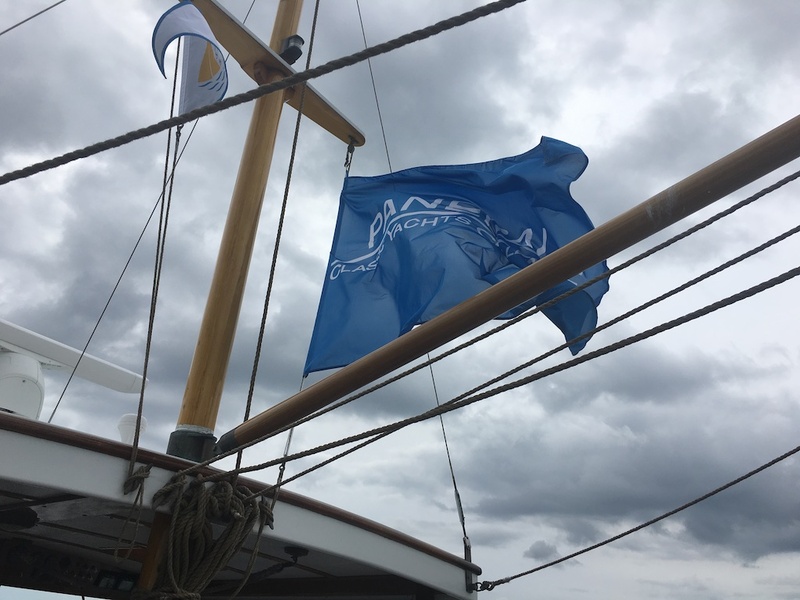 As the event came to a close, I was pleasantly surprised at the enjoyment and excitement that yacht racing had to offer. 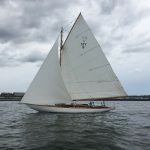 Maybe next year if I am invited again I will get to spend some time on the race boats as well to get a true feeling of what it’s like to man the ship. 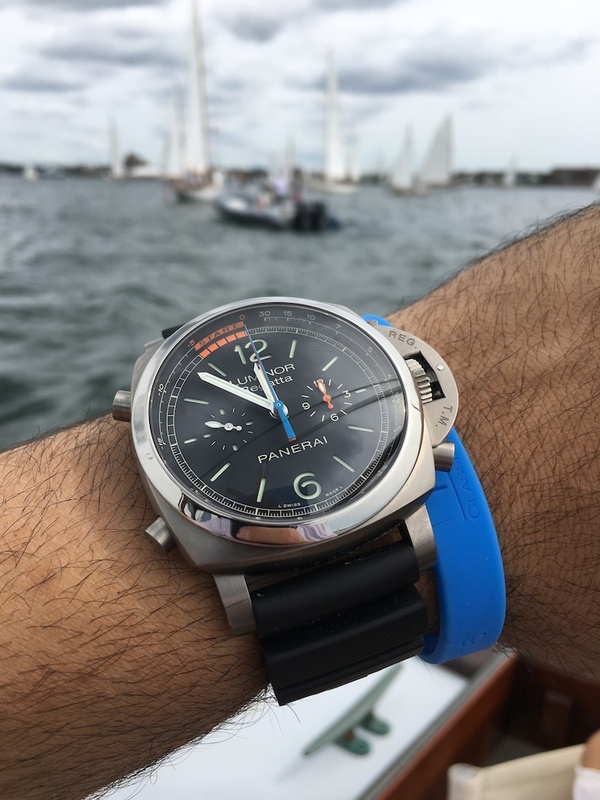 I have to definitely thank the entire Panerai team for hosting such an amazing experience in Newport during Labor Day weekend. 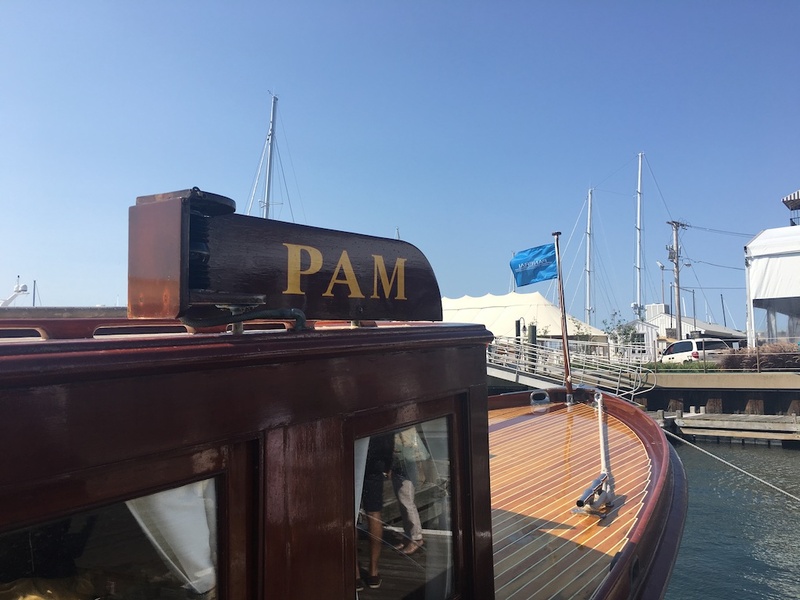 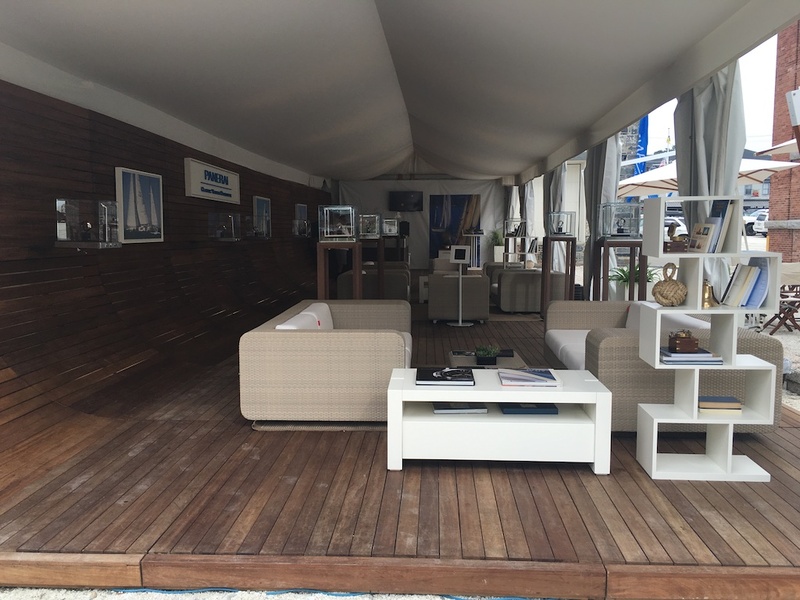 As Officine Panerai continues to evolve as a brand, it is always good to know that they continue to pay tribute to their roots by partnering up with events such as this.